Oh, what to do about the slightly imperfect? I'm almost done with my "Ladybug Luck" set, and I think they're coming out really nicely, almost exactly how I envisioned them! I printed the ladybug in black and the wording in gold. I was going to letterpress the red shell on as well, but I didn't want to lose the emboss/deboss effect of the ladybug's black dots. So I decided to color them in by hand instead. I haven't colored by hand in a really long time, and staying in the lines was never my strong point, so there were a few that are just a tiny bit off...still passable, but I don't want to sell them as they're not up to my standard. But they're not bad enough to throw away or reuse as scrap or anything, so I'm in a quandary about what to do. I'm thinking of putting them in a "Slightly Imperfect" basket at my open studio or maybe the next fair I go to and giving them out as freebies or something. I don't know. The bottom line is that I don't want the slightly imperfect to represent my work, but I don't want to just throw them away either! Oh, what to do? I finally got around to these cards that I have been planning to print all summer long. 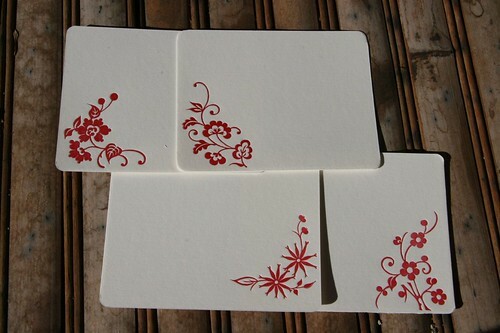 They are A2 flat cards with rounded corners, printed on thick Crane's Lettra Pearl White, and will be paired with a red envelope. 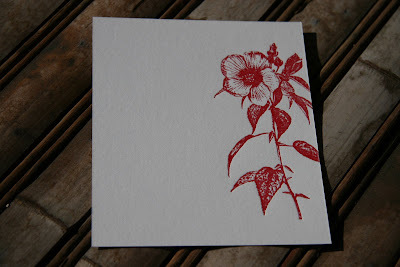 I am planning on packing these in sets of 8 (2 of each design) in a nice stationery box, perfect for gift-giving! 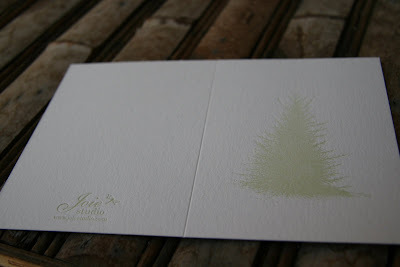 Here's Joie Studio's first holiday card of the season! I can't decide whether to leave this alone since it already looks so great or to print a "Happy Holidays" on the card as well. In any case, here are more pictures! This is the first card I printed yesterday in my sage run on my Pearl. 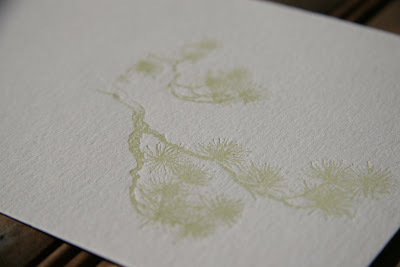 I love the branches -- it has a very Japanese feel to it, and I call this my "Zen" print. These cards are A2 size, folded, and blank inside. I still have to score them and fold them, but I think they came out beautifully. Whew! I just cleaned the Pearl. Today's run on the Pearl has been a dream. Today was just supposed to be a test run -- I thought I would have to make some adjustments on the press, but once I put ink on the press, it was ready to go! Everything was set perfectly. I underpacked the platen as I didn't know how exactly the platen screws were set, locked my form in my chase, set my guides, and pulled a print. Which came out perfectly. No need for makeready, no need for any adjustments. PERFECT. So perfect that today's test run became my first run on the Pearl. 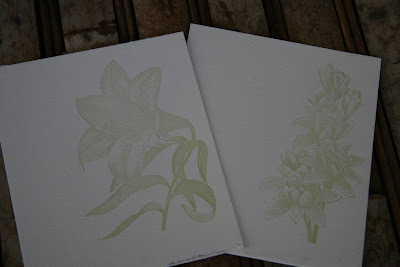 I did a sage green run, printing the flower designs for two of the months for my 2008 letterpress desk calendar. 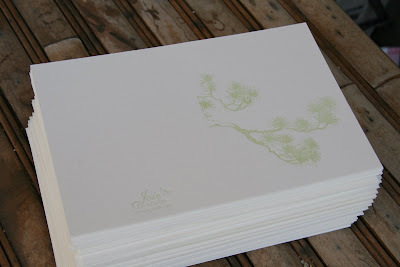 I also printed my Zen design on A2 cardstock and started on some holiday cards. I printed over 600 pieces today, and my wrists aren't sore and my arms aren't tired. I hit one snag when I tried to print coasters -- apparently the Pearl was set perfectly for paper, but not for thicker coaster stock. It's been over 30 years since the platen screws have been messed with, and I really hesitate to even touch them because it's such a pain to adjust platen screws, especially when it's already set perfectly for paper. 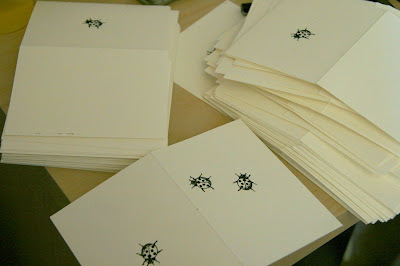 All in all, today was a great letterpress day! I'm so ecstatic over the results! Tomorrow when there's good light again I will photograph all the great prints I made today. I'm so happy my sister talked me into buying this new press! Joie Studio is on IndiePublic! I've heard good things about IndiePublic, so I decided to check it out. Check Joie Studio out on IndiePublic! I'm trying it out to see how it compares to the tried-and-true MySpace. I know a lot of people love Facebook, too, so I have to think about whether I want to keep up Joie Studio on three networking site. First Run of the Golding Pearl! Using our Flip Video, I recorded about 15 seconds of the Golding Pearl in action today. I have to say, it moves beautifully! I'm so impressed by how well this little 400 lb. press works. I'll get my husband to record me actually feeding the press at a later date. Enjoy! Add Joie Studio as a Friend on Myspace! Joie Studio is now on MySpace! Check us out at http://www.myspace.com/joiestudio and add us as a friend! 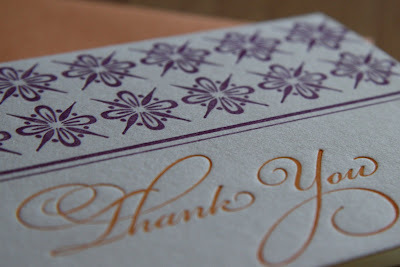 I designed this awhile back with black tiles and the "Thank You" in pink, but a client wanted it in orange and plum. It came out beautifully on Crane's Lettra, and I love how the font's swirls work with the paper to show off such a great impression. I will eventually print the original design, but I just wanted to share the finished product! It's the Akiles Diamond 1 Corner Rounder. I'm pretty happy with it thus far. Mostly I got it because the different dies are WAY cheaper than the Lassco model. 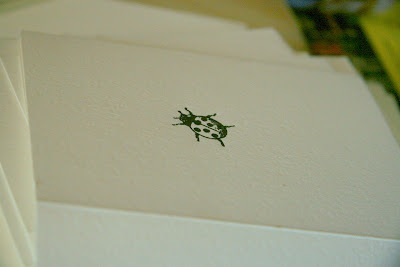 The studio is overrun with bugs...cute little ladybugs, that is! 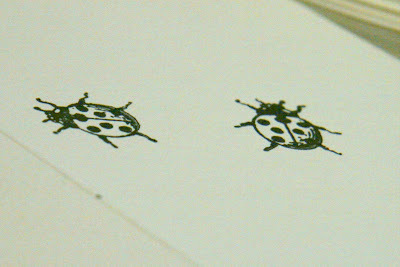 I just finished printing the first color for my ladybug cards. It turned out beautifully! I need to wait for them to dry so I can put the second and third colors. More bugs coming up! Whew! September is not even half over, and I know I still have so much to do. Unfortunately, this means I won't be taking any custom orders through the month of September and maybe half of October while I go into production for my holiday line of items. The mailing list for Joie Studio is now up and functional. I promise it will be a low-volume e-mail list, full of sales announcements, special events, and special offers for list members. 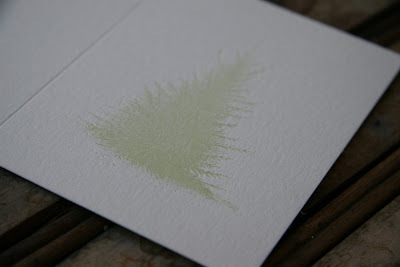 My holiday line of cards and gift items is almost done. I've been finalizing designs and sending them out for the plates to be made. So far, I've sent in over 225 square inches of design, and I'm not even a third of the way done! Cleaning the Pearl and the room that it is in. Along with the Pearl, my husband, his friends, and I basically moved my half of our home office into my new work area. Organizing and putting everything in place has been a real chore. Since it's a fact you can't print without paper, I've been getting paper cut down to size, sourcing more paper and envelopes, and searching for packaging supplies. Joie Studio has been accepted as a vendor to Handmade for the Holidays on November 23rd and 24th. Yay! Now, it's the tricky business of figuring out exactly how much to bring to a 2-day, super huge craft fair like this one. I'm going to put some previews of my holiday line throughout the month, as well as progress on getting the Pearl running. I'm hoping to do a test run this weekend! 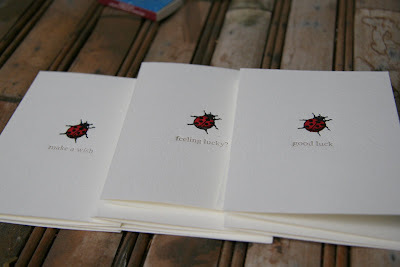 So Joie Studio's letterpress store is officially open on Etsy! I've listed 7 items so far. If you want a different quantity than what is listed, please email me or contact me through the Etsy site. Check it out, and enjoy! You know, I've had a fairly easy time with my presses thus far (I can't believe I'm in the multiple! ), because most of the "fixing up" that I have needed to do have centered around recovering the rollers and cleaning off the grime. I need to get a spring and replace a belt on the motor of the Golding Pearl, but even without those fixes, the press runs without much issue. 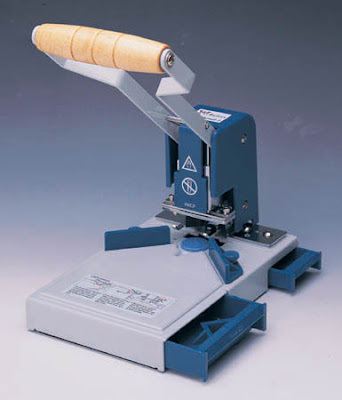 The rollers will generally be one thing that will always need to be dealt with when buying these kinds of presses. Generally rollers over the course of time degrade, shrink, swell, get warped, melt off, or something. I'm glad I found Adrian and Jane at Ramco Roller in San Dimas, who not only have great prices for rubber rollers, but have pretty fast turnaround and are genuinely nice people. I just brought them the old crusty composition rollers and the roller trucks from the Pearl, and Adrian said that he'd get them back to me early next week. The trucks are needed because Adrian makes the rollers based on the size of the trucks. This is especially important if you don't have the original specifications on what diameter the rollers should be. Adrian cleans off the roller cores (the metal rod the roller sits on), puts rubber on them, and then hand grinds them down to size. He will drill a hole on both sides of the roller core if needed so the roller can be put on the machine. I know from experience that some other roller makers won't do this for you if you want to switch from composition to rubber, so this saves on the expense of buying new roller cores! 1.5" - 2" diameter, add $10. Tell them Tina sent you! Whew! What a day! In 100+ degree weather here in LA, with the help of good friends, we loaded (and then unloaded) the 400lb. press and the type cabinet full of type! 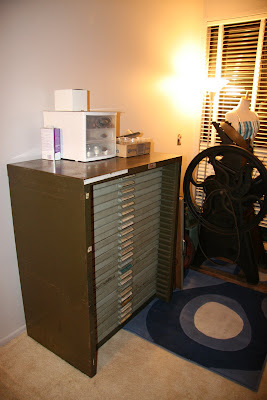 Here are some pictures of the cabinet and the press in my new studio! 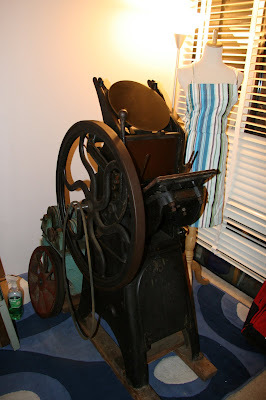 I still have to put the press back together and fix up the press, but here are the first pictures! I'll post more pictures once I get the rest of the place cleaned up! My friends and I constantly discuss impression in letterpress. Specifically, when deep impression is TOO deep. In letterpress, the most important thing has always been a good, even impression. 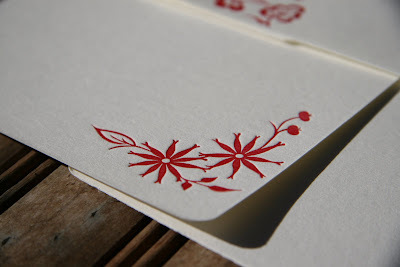 Letterpress purists will insist upon leaving nothing but a "kiss" impression, barely any impression at all. In fact, if you were to see this type of printing, which I've done while learning letterpress, it would be hard to distinguish it from offset printing except for the paper used. 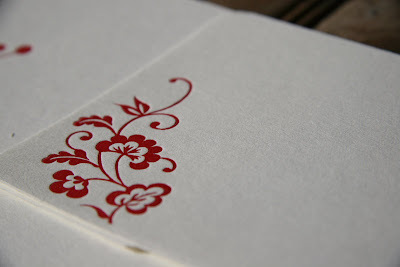 Deep impression, letterpress instructors may tell you, is a sign of bad printing because it renders the opposite side of the paper useless for printing or anything else. 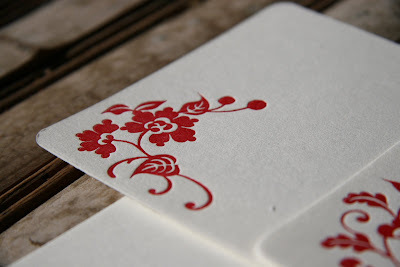 The deep impression that letterpress is able to provide, however, adds a very tactile quality to the printing and gives it an artisan flair. 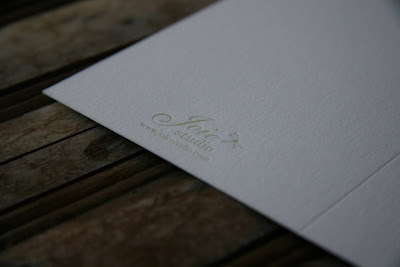 And since letterpress is such a labor-intensive affair, it needs the artisan quality in order to remain competitive with newer, less labor intensive (and therefore cheaper) techniques. 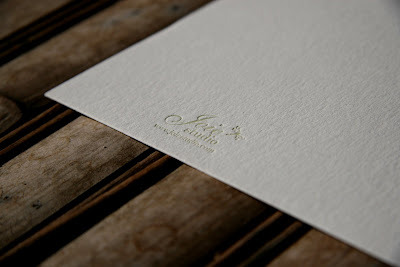 Too deep of an impression, however, which is often seen in letterpress, not only adds a reverse wording braille like emboss to the back of the paper, rendering that side useless, but since paper only has so much give, we've also seen it crease and fold the paper where the too deep impression exists. 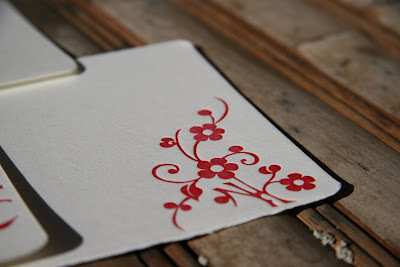 It becomes a balance then, to give an impression deep enough to satisfy today's market's tastes, but light enough to leave the opposite side useable if printing a notecard or business card or the like. I think this is actually going to be the new mark of a good letterpress printer -- to know how to vary impression to the use of the final product.